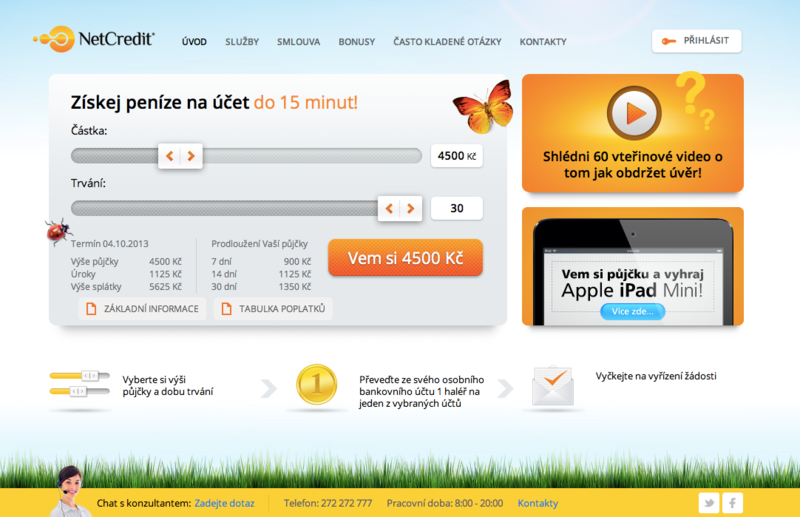 Website and integrated CMS. 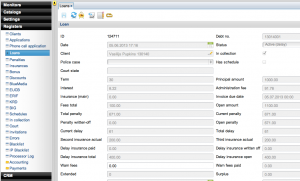 The client portal has such functions as profile data management, information on outstanding loans, notifications and payment history. The base module for lending can automate such loan-related functions and procedures as client identification, application receiving, credit scoring, decision-making, loan approval and pay-out, automatic processing of incoming payments, registration of fines, and loan term extensions. This module supports lending procedures using the Internet portal, SMS, telephone, or in person. Registration of client communications, distribution of advertising materials, automated tasks of client operators and debt collectors. Registration of loan operations – issuing (with distribution of incoming funds by relevant periods) and repayment of loans, automatic creation of accruals and registration of other core activity operations. Register of incentives for client attraction. The debt collection module automates notification by SMS, e-mail or mail at predefined intervals. 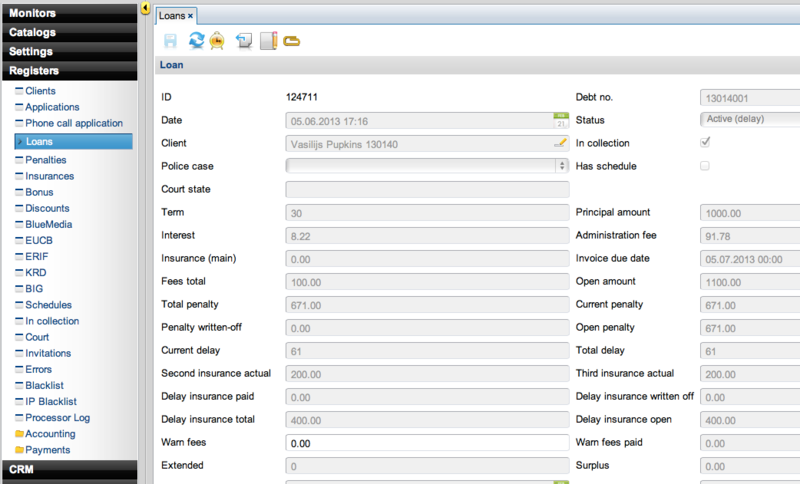 This module can be used to regularly send information on overdue debts to predefined collection organizations and submit information on debtors to credit history databases. It also supports the preparation of loan repayment schedules and automatic termination in cases of failure to make payments within the schedule, and assists in the collection of debts by litigation. The system has been created in a way that allows it to be adapted to any type of lending operations in any country. 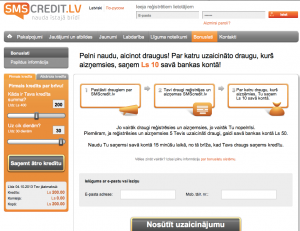 Leading payday loan companies in many countries – such as Poland, the Czech Republic, Russia, Finland, Sweden, Latvia, and Lithuania – already use this solution. 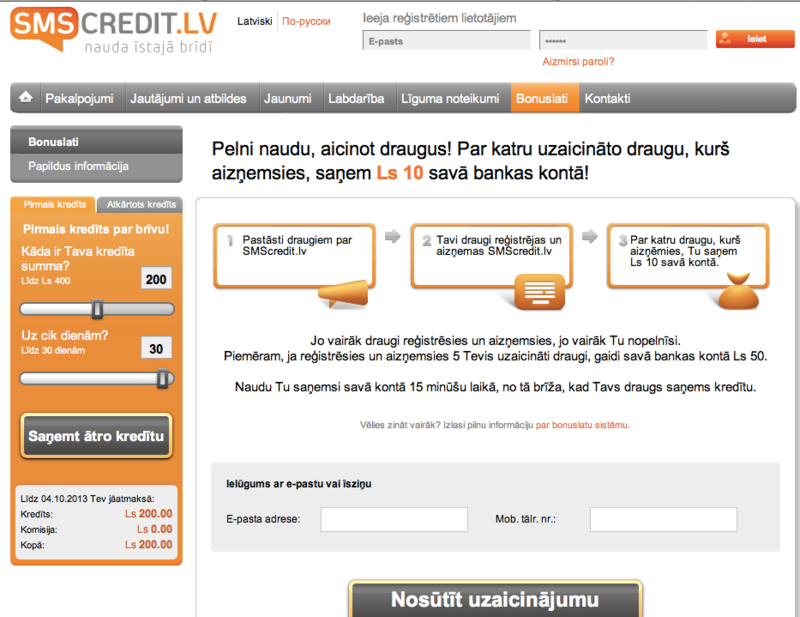 Our clients include SMScredit.lv, vivus.se, netcredit.pl, netcredit.cz and zejem.ru. We provide warranty servicing and repairs during the 1st year of operation and implement changes in the system according to your needs (through our support system at support.bi.lv). Should you wish to, you may take over the system maintenance after the warranty period.